What training do your learners need today? To say that L&D runs lean is an understatement. 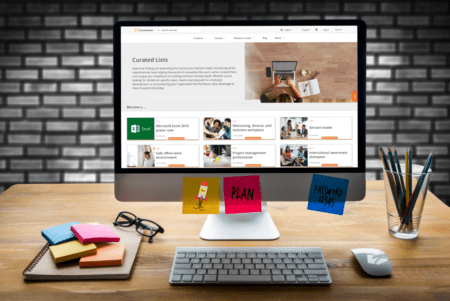 With limited time, budget, and resources, L&D teams like yours are relying more on their trusted content partner for curation to save time, learn about hot training topics, and prepare the organization for the future. This is where OpenSesame and our team of curation experts can help. We’ve worked with hundreds of organizations like yours helping them find, curate, and deploy courses to learners. Harnessing this experience we’ve created OpenSesame Curated Lists—a quick and easy way for you find expertly curated courses to help your learners hone critical business skills, prepare for a new role, achieve organizational competencies, and more. Preparation for new positions and responsibilities. At a glance, you can see how many courses are in each Curated List and whether the courses in each List are included in our most popular subscription offering, OpenSesame Plus. Within each Curated List, you’ll be able to see additional information including course ratings, length, publishers, and (when logged in) you can view a course demo if one is available. Our curation experts regularly update Curated Lists to ensure you always have access to the most current and relevant content. You can easily stay up to date with changes to Curated Lists by following your favorite ones. Just click the List and then click the Follow button. Log into your OpenSesame account or, if you’re new to OpenSesame, register to create one. You’ll see the Curated Lists you’re following within My Lists in the All tab as well as the new Following tab. Need to make changes to a Curated List? No problem. Within the List, select Duplicate from the List settings menu (gear icon) to create a copy, enter a list title and description, and click Duplicate. Your new duplicated List can be found in the All and Created tabs. You can now add, remove, and organize courses as needed. Note that duplicated Lists will not reflect any course updates from OpenSesame. From here, Lists you’ve duplicated and modified work like all your other Lists. You can collaborate with stakeholders, collect feedback, view course demos, and easily add courses to your LMS for quick deployment to learners. We’re here to make your job easier, including curating so you don’t have to. Share with us what other Curated Lists you would like to see in the future by visiting the OpenSesame Community, click the Looking for elearning recommendations topic, and then select the Request new Curated List topics post. Our curation team will review your requests for future Curated Lists.